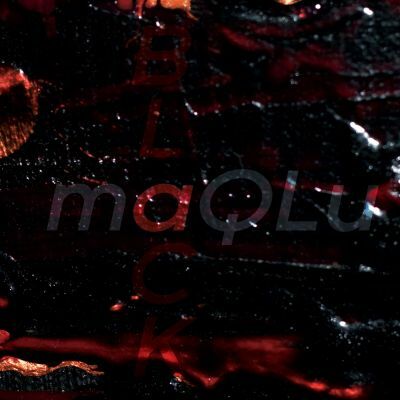 Maqlu‘s second album ‘Black‘ provides the listener with a new pallet of sounds to play with. With the simple drums, a minimal amount synths and some well-placed samples of instruments, that you wouldn’t expect from an electro album, you can feel yourself drift off into an strange new world. Even though her chilling vocals play a background role in the album, you get the sense that without them, the songs would devolve into an amalgamation of random sounds. Each track, being no longer than four minutes, manages to subtly alter the listener’s mood. ‘Siamese Twins‘ opens the album with the panning of insect like noises from speaker to speaker, climaxing with just a simple bleep. This leads you anxiously into the slow march like rhythm that is emphasised by a hollow bass drum. The song contains a minimal amount of synth because she wants you to strain your ears just to hear the words. 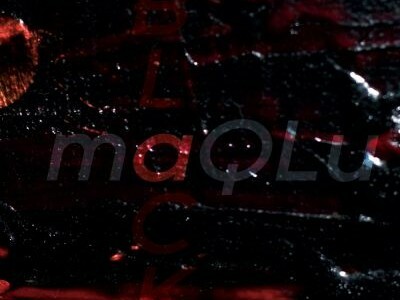 The vocals are made grimey with a very small amount of distortion. The samples, like the simple buzz and the slow clicking noise, are what pushes the song forward. With each verse ending in iambic pentameter which is emphasised by the momentary increase in tempo from the bass drum. ‘Wh*re‘ picks up the tempo with simple wooden drum beat that is very tribal. The distorted guitar riffs get raise the tempo. This one continues the theme of using interesting sounds, like chiming bell melodies, to great effect. The only drawback to this song is with such a cacophony of noises the vocals are inaudible over it. ‘Martyr‘ introduces main synth lines into the album with great effect. With the funky bass loop which is made more prominent by a low growling bass. The thing that stands out about this song is the out of tune trumpet playing a slow dirge which keeps all the sounds in check. Clashing symbols and marching band drums are well placed so you don’t feel to brought by the trumpets. The song is finally topped off with an eerie organ which makes you feel like you are in a 1930’s horror film. ‘March On‘ bursts into action with its creepy take on futurepop synth lines. With the main one being slightly too high pitched and slightly out of key. Underneath all the synthesizers and sound effects lies a slow plodding bass and very simple 4/4 bass drum. The last track of the album is an eerie ending to the album. With a screeching organ and a synth that sounds like someone screaming. The brutal drum beat gives you the impression that someone is stalking you. Out of time vocals add to the whole discordant feel of the song. This album is a breath of fresh air in the electro scene. With the whole feel of the album being dirty and gritty not made in some sterilised room. Most of the songs don’t follow any recognisable music structure and that is good. Maqlu doesn’t want you to think about the music, she just wants you to enjoy it. There is no message, it’s just her experimenting with sounds and she ultimately doesn’t care what we think.